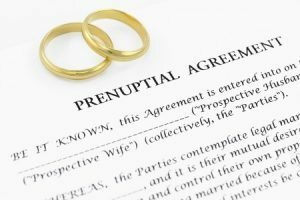 Society is well acquainted with the Prenuptial Agreement – which essentially lays out what the terms of a potential separation and divorce will be like. The purpose is to protect the assets, personal and business, of an individual who has spent a lifetime, or whose family has spent generation, growing. They don’t always stick; and in some cases can be nullified if they were written outside of reasonable or fair terms to begin with. The key to crafting a prenuptial agreement that will hold up down the road is to have someone well experienced with New York divorce laws. Mary Katherine Brown is a dedicated New York family lawyer with extensive experience drafting New York prenup agreements. A Postnuptial agreement can take the form of a modification of an agreement that began as a Prenuptial Agreement, or it can lay out the terms for an anticipated divorce. For instance if a couple plans to divide their household an assets at the time that their youngest child graduates from high school – or if they are disabled – meets a particular milestone. If you have questions about nuptial agreements, please share your personal story below, or write to arrange for a consultation. If you’re ready to provide the details to us for your Prenuptial Agreement, please visit our Legal Affairs Center.